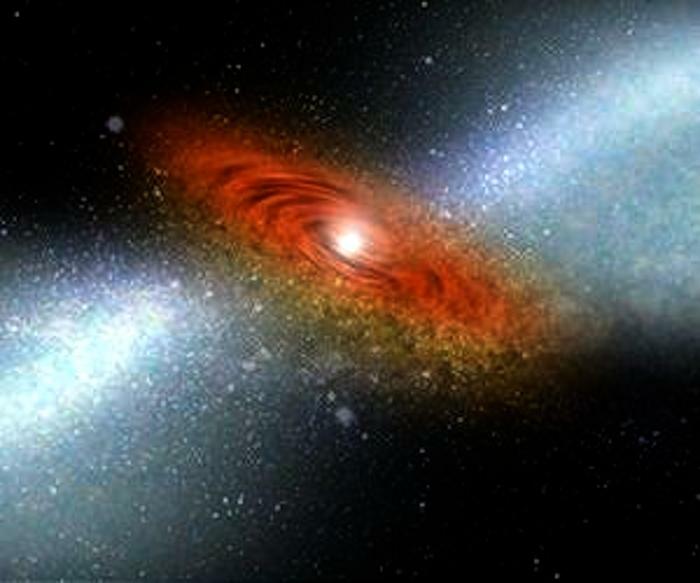 In an artist's conception, heated galactic wind shown in the hazy portion of the picture emanates from the bright quasar at the edge of a black hole, scattering dust and gas. If allowed to cool and condense, that dust and gas would instead begin to form stars. Image courtesy Johns Hopkins University. A paper published in the Monthly Notices of the Royal Astronomical Society finds evidence supporting the argument that the answer was energy feedback from quasars within the galaxies where stars are born. That is, intense radiation and galaxy-scale winds emitted by the quasars - the most luminous objects in the universe - heats up clouds of dust and gas. The heat prevents that material from cooling and forming more dense clouds, and eventually stars. "I would argue that this is the first convincing observational evidence of the presence of quasar feedback when the universe was only a quarter of its present age, when the cosmic star formation was most vigorous," said Tobias Marriage, an assistant professor in the university's Henry A. Rowland Department of Physics and Astronomy. While the findings appearing in the journal published by the Oxford University Press are not conclusive, Marriage said, the evidence is very compelling and has scientists excited. "It's like finding a smoking gun with fingerprints near the body, but not finding the bullet to match the gun," Marriage said. Specifically, investigators looked at information on 17,468 galaxies and found a tracer of energy known as the Sunyaev-Zel'dovich Effect. The phenomenon, named for two Russian physicists who predicted it nearly 50 years ago, appears when high-energy electrons disturb the Cosmic Microwave Background. The CMB is a pervasive sea of microwave radiation, a remnant from the superheated birth of the universe some 13.7 billion years ago. Devin Crichton, a Johns Hopkins graduate student and the paper's lead author, said the thermal energy levels were analyzed to see if they rise above predictions for what it would take to stop star formation. A large number of galaxies were studied to give the study statistical heft, he said. "For feedback to turn off star formation, it must be occurring broadly," said Crichton, one of five Johns Hopkins scientists who led the work conducted by a total of 23 investigators from 18 institutions. Most of the scientists are members of the Atacama Cosmology Telescope collaboration, named for one of the three instruments used in the study. To take the faint temperature measurements that would show the Sunyaev-Zel'dovich Effect, the scientists used information gathered by two ground-based telescopes and one receiver mounted on a space observatory. Using several instruments with different strengths in search of the SZ Effect is relatively new, Marriage said. "It's a pretty wild sort of thermometer," he said. Nadia L. Zakamska, an assistant professor in the Department of Physics and Astronomy at Johns Hopkins and one of the report's co-authors, said it is only in the last few years that evidence of this phenomenon from direct observation has been compiled. The SZ Effect, she said, is a novel approach to the subject, making clearer the full effect of galactic wind on the surrounding galaxy. "Unlike all other methods that are probing small clumps within the wind, the Sunyaev-Zeldovich Effect is sensitive to the bulk of the wind, the extremely hot plasma that's filling the volume of the wind and is completely undetectable using any other technique," she said.